Based out of Newport Beach, Bluewater Locksmith is the premier mobile locksmith service in Orange County. Their valued clients have put their trust and family's safety with them for many generations. Sonia Texeira Events is headquartered in Newport Beach, CA. Sonia Teixeira Events provides full-service wedding and events planning. Contact Sonia at her beautiful website to have her plan your next memorable event. Hess-Verdon & Associates, a Professional Law Corp. headquartered in Newport Beach, CA is a full-service law firm with attorneys who leverage their expertise across many different practice areas. When a local dojo full of Black Belts need a website, it's time to break out the Ninja design skills and build them what you build all your clients. A great site that's fully mobile-responsive. When you're a local real estate agent who specializes in high-end beach properties, you want to partner with a website designer who can exceed your expectations. That's exactly what we did for this build. DRAFTCARD is a Wordpress-based App delivery website that specializes in highlighting the accomplishments and stats of High School athletes who are looking to be recruited by colleges. David Steele knew exactly what they wanted. A robust eCommerce site with all the conversion bells and whistles that get visitors to take out their wallets and buy clever and unique product solutions offered for sale. Cannabagz is an eCommerce company who hired us to get their custom cannabis packaging business off to a strong start. Cannabagz offers custom packing solutions for cannabis with a WooCommerce cart. United Capital Group offers lease financing for all kinds of construction and industrial equipment. They provide financing for everything from heavy equipment to dental equipment. Sticky Brain Website Design excels in the construction of eCommerce websites that not only are pleasing to the eye, but that include critical additions that convert visitors into buyers. We delivery high conversions. A boutique staffing agency providing the very best Personal & Executive Assistants, Managers & Personal Chefs across the United States. The Pocketbook Agency excels in placing individuals in great assistant jobs. A mobile fashion boutique on wheels that drives all over Southern California with the hottest trends of women's clothing at great prices. A responsive website with a full and robust Woocommerce shopping cart. Privately held Global Media Group is a media buying company that needed a professional website. President Rita Campbell recruited us to help her portray a corporate reputation that's second to none. Unlike multi-location LASIK centers, Saddleback Eye Center maintains a solitary focus on LASIK by Dr. Charles Manger. Dr. Manger has personally performed over 76,000 LASIK eye surgery procedures. In 1947, the Dempsey Family and a group of friends had a dream of going to the Kentucky Derby. In the ensuing years, the family had shared that dream with thousands of Kentucky Derby racing fans. Walter Scott Perry is truly a visionary. He is both Founder and CEO of Ecotech Design and has mastered the seemingly impossible task of designing and assembling buildings out of 20' and 40' shipping containers. Although we can't take full credit for the design of this site, we were contacted to solve issues the initial designer had created. The designer and client apparently came to a crossroads and the designer jumped ship. The owners of Mitchell-Vance Laboratories were referred to us to not only efficiently and clearly convey their product message, but to make sure that their company had an opportunity to climb in the search engines. Brad Podosin of Alianza Development heads this company of experienced independent construction management professionals. Alianza provides management and services to the retail construction industry. Partners Capital Group is one of the largest privately-held independent finance companies in the U.S. that specializes in equipment financing.We put them online with a great responsive, animated website. Arthur Psaltis is the owner of Guarantee Pest Control and he came to us for for a complete website re-design as his was not responsive and needed to be in order to rank higher in the search engines. This client came to us to design & build a high-converting eCommerce website. As with all our eCommerce designs, this site converts like crazy & is fully responsive so that it looks and works perfectly on all mobile devices. Bramble & Co Candles started as a hobby for Michelle Bendetti. Frustration with the high cost and poor quality of many candles, Michelle decided to research and experiment with high quality ingredients. 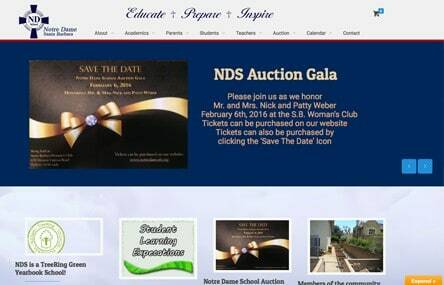 Notre Dame School is a Catholic elementary school serving the students of Santa Barbara. They came to us in order to rebuild their aging website and convert over to the Wordpress platform. Redtail Packing personnel came to us asking for a website rebuild that included a robust theme for Wordpress, site security and stability and animations. Don Bassler was the head designer and exceeded this client's expectations. Whitecap Development CEO, Laurie Capello commissioned Don Bassler, Chief Designer at Sticky Brain to help her establish an online presence. We incorporated a clean & functional design with lots of whitespace. This is a video training membership website that teaches folks how to build their own Wordpress website. It incorporates the WooCommerce shopping cart and displays our talents as video creators and editors as well.